Are you a schedule sort of person? I love to live a bit more flexibly, but with four kids and very specific windows of time during the day to get anything done, I've become more of a schedule person. That doesn't mean that I don't throw the schedule out the window sometime... but most of the time, we keep things pretty predictable around here. Follow me over on Instagram for a lot of simple toddler activity ideas. I'm @kristinatoddlerapproved. For me, schedules help me feel like I am actually accomplishing something. With four kiddos and so much to do, sometimes I feel like my day is a mess of haphazard moments where I never actually complete ANYTHING. Having designated times during the day to focus on specific things really helps me stay more sane. My youngest daughter is currently one and will be two in January. Here's a quick overview of what our typical "perfect" or favorite schedule has been for the past year. By "perfect," I mean, when she isn't sick, we don't have a big event happening that infiltrates our schedule, and I am not spending the whole day running errands. 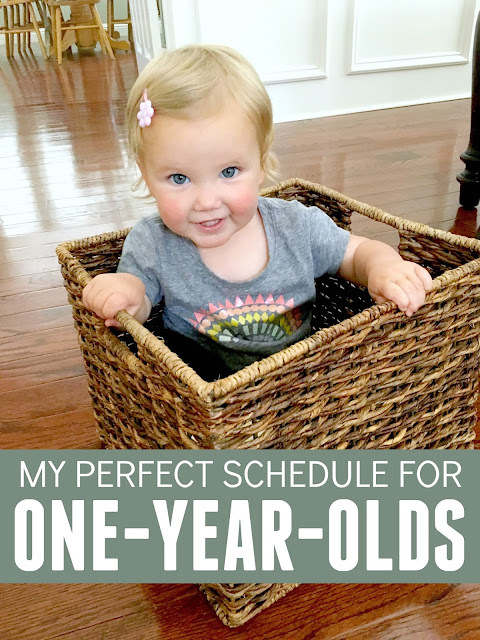 You can find my perfect schedule for 2-year-olds here. It is blissful if this actually happens. I have also had kids regularly wake up before 7am and we basically park it on the couch and cuddle and watch TV until it seemed OK to be awake. If my babies wake up before 7am I will sometimes throw on Elmo and strap them into their high chair nearby with some Cheerios and lie on the couch and try and go back to sleep. My daughter is ready for breakfast the second she wakes up! Sometimes my big kids will get her out of bed and make her a toasted waffle and sometimes I will help feed her oatmeal or cereal. We keep breakfast pretty low-key during the weekdays. You can read more about feeding babies and toddlers and some of our tips here. Usually in the morning once I get my two big kids off to school, I work on cleaning up breakfast while my one-year-old roams the kitchen playing with her cars and trucks. She has been obsessed with her firetruck all year and loves to roll it around. I keep a big basket of trucks and little people toys right next to the kitchen so that she has easy access to them. She also loves her pull-back Melissa & Doug cars and her Little People pink bus. It is nice to have a few things near the kitchen that she can play with independently while I try and pick up the disaster the my kitchen usually is in the morning! Often in the morning after we've picked up a little bit, I either shower or we head out for a workout. I love to jog while I push my daughter in the jogging stroller and my 5-year-old rides his scooter alongside. Almost 90% of the time we jog to the park. Once a week I host a weekly park playgroup with friends at different parks around our town. On the other days, we just go to the park on our own. I love having chat time with my friends at the park on park days, but I also love just going to the park without friends too so that I actually pay attention to my kiddos and play with them! My one-year-old is a bit swing obsessed, so I usually spend most of the time pushing her on the swing. I've shared my favorite tips for taking a toddler to the park here, if you need any ideas. Mid-morning we usually have to drop off my 5-year-old at school and then my daughter and I head home for lunch and some quick playtime. Sometimes I pull out old favorite activities (like this giant shape sorter), and sometimes we try out new ideas (like our DIY train table). I love hanging out with my kids, but I live for that 1-2 hours of free time during naptime too! I usually grab a diet coke and some chocolate and settle in to do some work on the blog, answer emails, or do other projects. If we don't get outside in the afternoon once my bid kids get home from school, the day seems to drag on forever. Most of the time we just hang out in our backyard, but sometimes we have sports or other activities and we'll go to the park. Sometimes we'll play out front with our neighbors and sometimes the big kids will have friends over and my toddler will run around after them. Some of our favorite backyard activities and play items can be found here. If there is time, I like to do a simple craft or activity with my toddler and preschooler while my two older kids finish their homework and piano. Sometimes I put together an easy sensory bin while I made dinner that they can play with together. Some of our favorite simple toddler activities can be found here. My favorite sensory bins are cereal sensory bins and a big ball pit in a plastic tub. Painting with Do-A-Dot Markers is always a hit too... even though the markers tend to cover hands, fingers, and faces too. Dinner is never fancy here. Crockpot meals are my favorite and lately we are loving Butter Chicken, rice, and Naan. We also do a lot of destructed meals like taco salads, Hawaiian haystacks, and burritos so that kids have choice and can build their own meal. The majority of food that we make takes less than 30 minutes to heat up, assemble, and serve. Sometimes we just have a pizza night or make quesadillas along with a fruit or veggie. My favorite thing to see is my kids playing with one another. I love watching them play games, come up with pretend play scenarios, and just goof off together. Basket rides are always a favorite. Sometimes we skip straight to baths and do playtime right before bed since my toddler likes to be a messy eater and get covered head to toe with food sometimes. Reading books together is something my toddler won't ever let us forget. Often she will come around with me as I tuck each of the big kids in bed and she'll listen to their stories. Sometimes, by the time we get to her, I'm ready to skip the books... but she will not let that happen! Her favorite books right now include Sleepy Toes, anything by Karen Katz, and books with animals in them... like the Little Red Hen. Do you have any favorite board books that your toddler loves? Our night usually ends around 8pm when everyone has been read to, tucked in, hugged and kissed. Putting my toddler to bed is something both my husband and I love to do... so sometimes we will both sneak into her room and help put her to bed (while ignoring the noises of kids sneaking out of their rooms upstairs to get water or go to the bathroom one last time). One-year-old cuddles and kisses are the best! Another thing that we put on our schedule all day every day is a lot of HUGS! Anytime I can get a hug or a cuddle from my toddler, I sneak it. Somedays we do all of the things I have outlined in this schedule... and sometimes we only do one or two. Sometimes our toddler activities include jumping in laundry piles while I try and fold it all and put it away before the big kids come home. Some afternoons we just skip activities and watch a movie. I don't stick to this schedule in a strict fashion, I just like having it as a framework to guide my day if I need it. Alright, your turn. What does your day look like with your one-year-old? If you have older kids, how does their schedule fit in? Our not-so-perfect schedule goes through more of the nitty gritty of our schedule with all the cleaning and kid's schedules, etc... but I prefer to focus on this one!